Wild: Whether its size is caused by adaptation to the island’s other inhabitants, or by cross-breeding with another larger species, Melanocetus Anglerpescum is the largest form of Anglerfish I’ve ever heard of. Typically found only among the deepest, darkest expanses of the ocean, this creature preys on smaller fish while being an excellent source of food for larger predators. Domesticated: Exploring the depths of the ocean can be difficult. The cold, the lack of air, and the shocking absence of light combine to make travel very dangerous. 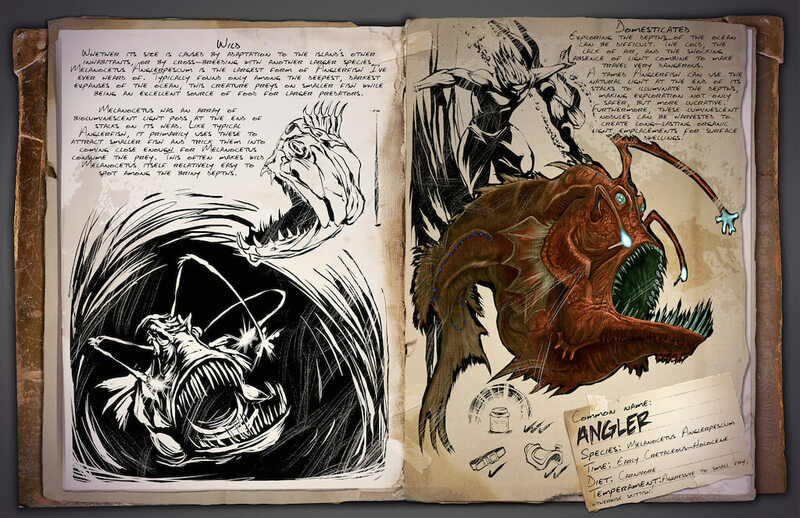 A tamed Anglerfish can use the natural light at the end of its stalks to illuminate the depths, making exploration not only safer, but more lucrative. Furthermore, these luminescent nodules can be harvest to create long-lasting organic light emplacements for surface dwellings! Known Information: Melanocetus has an array of bioluminescent light pods at the end of stalks on its head. Like typical Anglerfish, it primarily uses these to attract smaller fish and trick them into coming close enough for Melanocetus to consume the prey. This often makes wild Melanocetus itself relatively easy to spot among the briny depths.